I love the feeling of setting out measuring cups, butter to soften, jars of flour and wooden spoons. Seeing baking ingredients spread across my counter is a happy sight, and since baking is May’s theme for Tasting Jerusalem I was delighted to jump in and try something new and different. I’ve been playing with different flours lately, and when I spotted the tahini cookies in Jerusalem I thought the flavors might work well with almond and coconut flour in place of the all-purpose flour. I’m also using coconut sugar quite a bit now, as I like its caramelized, earthy flavor so I pulled out that jar, too. Tahini is a paste made of ground sesame seeds and is very popular in Middle Eastern cuisine. It can be made into a dip on its own, or it features prominently in halvah, hummus and baba ghanoush. In addition to the different flours and sugar, I added a generous amount of Maldon salt and mixed cinnamon into the dough. I scooped and rolled the dough, topped each with a slivered almond and popped the baking pan into the oven. The cookies emerged fragrant and toasty brown. 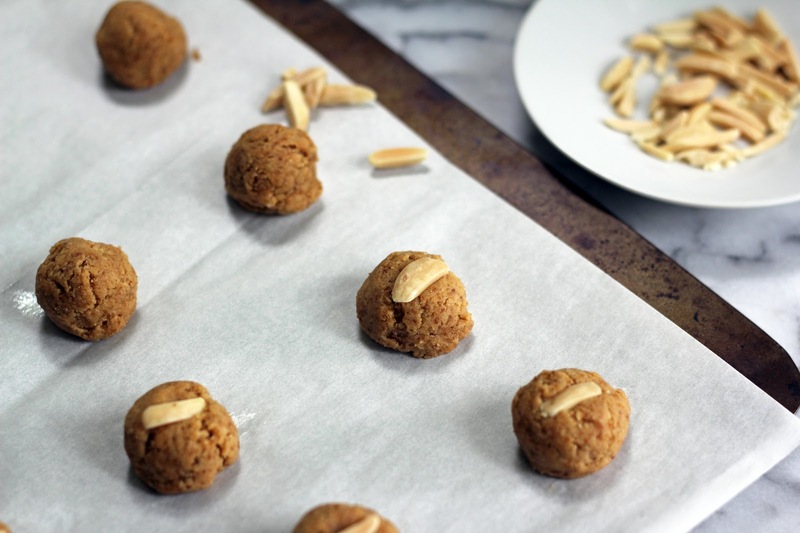 Rich from the tahini and butter, they almost taste like peanut butter cookies, with a texture rather like a shortbread biscuit. Perfumed with cinnamon, slightly sweet, and with a little hint of salt in each bite, these tiny gems made a terrific after-school snack with a glass of milk. And this morning, I nibbled a couple with my coffee for a satisfying breakfast treat. Preheat the oven to 400 degrees. Line a baking pan with parchment paper. Beat the sugar and butter together in a stand mixer or with an electric hand beater until combined. Add the tahini, vanilla, salt, cream and cinnamon and mix, then add the flours and mix further until a dough forms. It will be soft. Using a small cookie scoop or teaspoon, drop little balls of dough onto the cookie sheet (use half the dough to make about 20). Gently roll each into a smooth ball and place an almond sliver on top. Bake for 9-10 minutes, until they are golden brown. Remove from the oven and let cool for about 10 minutes before removing from the pan. Repeat with the remaining dough. The cookies will keep in a covered container for a few days. Wow Hannah - what an interesting variation! They are a lovely rich brown color and that almond on top just makes me want to grab one right from my screen. I am really intrigued by these and the spice cookies and still have my eye on that krantz cake and several others. We will just have to revisit this chapter several times! Thanks for a great post! I really need to get that cookbook - every recipe I've seen from it sounds so interesting. These cookies look terrific! Totally good stuff - thanks. Thank you, John! Having made over 20 recipes from Jerusalem now, I can highly recommend getting the book. So many of the dishes explode with fresh herbs and flavors. With warm summer days ahead, I'll be turning to many of the marvelous salad recipes. 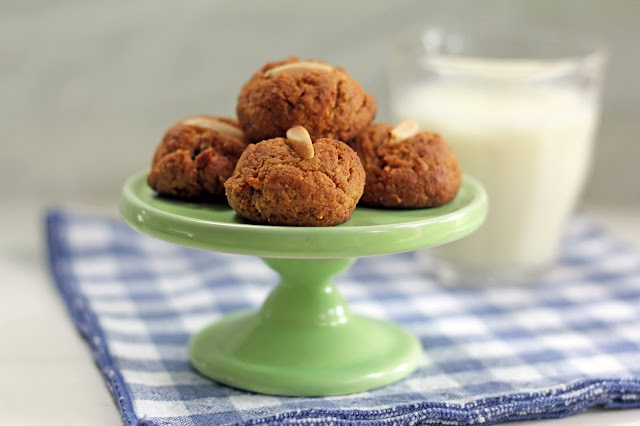 I love tahini cookies and also posted about them a few years back.Those are quite different from the ones I made so will try to make those the next time.I was just at a book launch of a new lovely Israeli cookbook which also has a tahini cookie recipe. Love how you used the recipe as a jumping off point! I love tahini, but have never had them before, what a great snack and I love the changes you made to the recipe. I also like coconut sugar. They are beautiful too! Thank you so much, Suzanne! 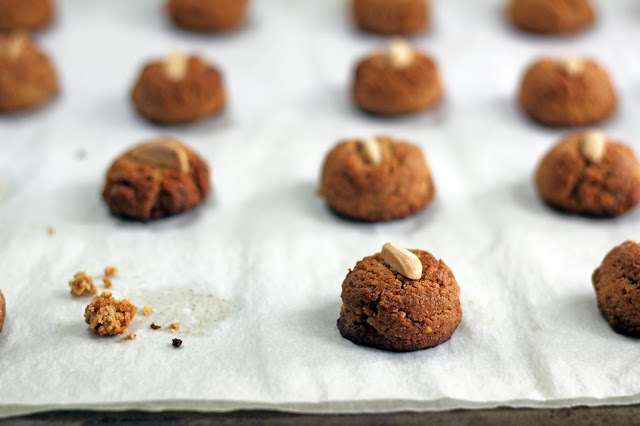 Tahini is wonderful to bake with and I think you would like these little cookies. Definitely a nice little snack to keep on hand. Hannah - They look great! I know lots of folks will appreciate the gluten-free variation. Now seeing yours, I'm tempted to make a batch (and dip them in chocolate!!). These sound terrific. Now if I just knew where the heck that jar of tahini is in all of my stored foods!! Thanks, Barb! I hadn't baked with tahini before either and really like the results. If I think in terms of peanut butter baked goods, it makes total sense. Good luck locating your jar and I hope you enjoy baking with it! Thanks, Alyssa! I think you'll like these cookies - not too sweet and a nice little snack. And as Michelle suggested above, dip them in chocolate for an extra delicious treat! I got Jerusalem for Mother's Day and I love it. I never would have thought to put tahini in a cookie and have only recently bought my first jar having labored under the misapprehension that tahini was too bitter for many years. Not sure what I was tasting that was bitter, but it wasn't the tahini! I think I shall make these for our next flight coming up soon! I'm happy you're enjoying Jerusalem, Brooke! So many delicious dishes to try. I have found plain tahini to be a bit bitter at times, too - sort of an after taste. But when mixed into a dip or baked, it disappears and the tahini flavor is wonderful. I hope you enjoy these cookies! I adore tahini. Never thought about doing it in a cookie though; sounds fabulous! Enjoy the sunshine this weekend! Isn't this sunshine amazing, Erina? I'm loving every moment. Baking with tahini is wonderful, rather like using peanut butter. I hope you enjoy it! this look soooo good. I don't usually have almond flour though - could I use some other type? spelt? Hi, you can definitely use another flour. The coconut flour absorbs a lot of moisture, so the almond flour helps balance it out. I would try subbing in 2 cups of spelt flour for the coconut and almond (maybe start with 1 1/2 cups and go from there until you have a soft dough). I hope that works well for you. I'm happy you stopped by! Oh, Hannah, these sound wonderful! Leave it to Ottolenghi to put tahini in cookies :) I love that you're using different kinds of flour and sugar in your baked goods lately. I've been afraid to try working with them as of yet, but your recent recipes are giving me plenty of encouragement! I hope to try these soon! Thank you, Brianne! I know, you can count on Ottolenghi to use tahini is a sweet way. I must say, it makes total sense, especially if you think of the ways peanut butter is used in baking. I hope you enjoy the cookies! Have a great weekend! Your cookies look terrific and your description alone makes them sound delicious. Thank you, Karen, I appreciate your kind words! These really are tasty little bites. I hope you have a terrific weekend! What a fantastic idea for a cookie! I can't eat the almonds, can I just use regular flour and maybe a couple of pine nuts on top?? Hi Susan, yes - you can definitely use a different flour. The coconut flour absorbs a lot of moisture, and the almond flour helps balance it out. You can use 2 cups of regular flour (this is what's in the original recipe) and that should work well. And pine nuts on top would be lovely! Wishing you a wonderful weekend! 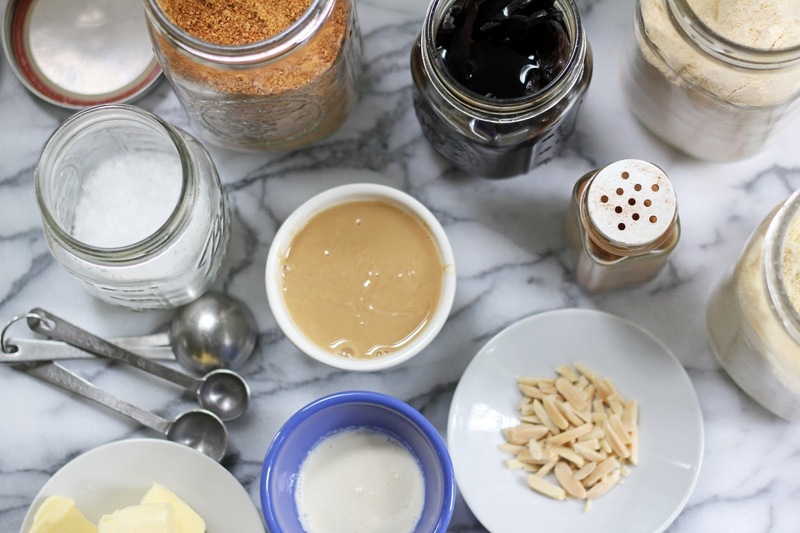 I love the beginning of this post....totally love that baking scene you created! Oh, thank you, Alex! Baking evokes such warm, cozy feelings for me and I love getting everything in place. I hope you're doing well and have a wonderful weekend! I agree about the feeling of getting ready to bake something new- I always get excited! 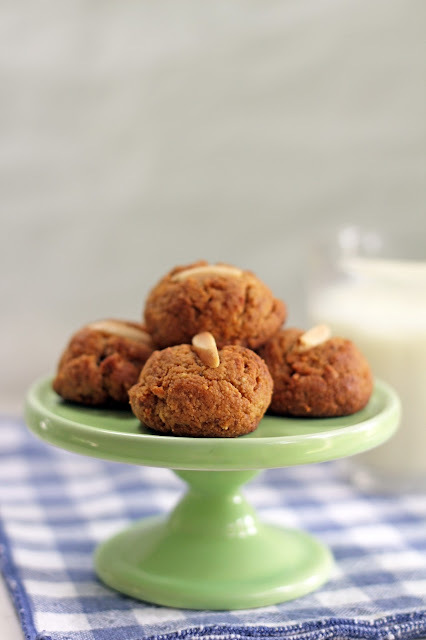 I love the look of these cookies too - tahini makes really nice cookies! Thank you, Donalyn! Baking is thrill, especially when making something new. I enjoy baking with tahini and will definitely do so again. I'm happy you stopped by and hope you have a wonderful weekend! Ahhh these cookies look so good! I can imagine myself grabbing one after another while I am reading or something...and all gone! They surely look addicting! Amazing pictures throughout! And my bad, congratulations and Mavel Tov on recent graduate!